This is the big one! And therefore, this post is broken into two. 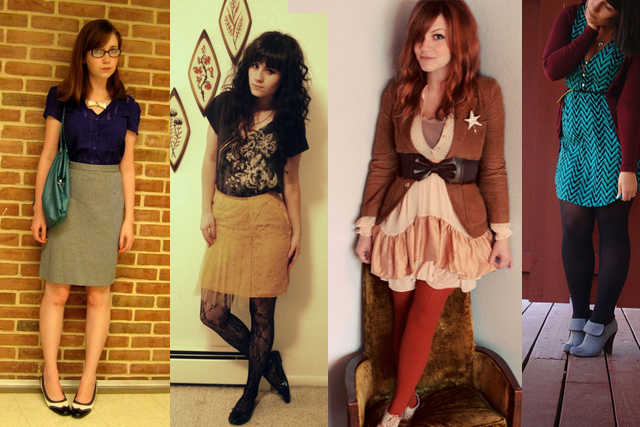 Here are my basic tips, kind of preliminary pep-talk post of how to take your own outfit photos. Which, by the way, is even harder when you have to direct your husband on how to use your Android's camera because he didn't charge his iPhone WHILE taking your outfit photos! Let's get into this! Your boyfriend/best friend/parent are all invaluable, I know, I know. But trust me when I say a tripod and remote is the best 20-70 dollars you will ever spend in terms of blogging expenses. Being able to control your own image and set things up yourself will help you more than anything else. There is a lot to be said for friends and family who can take a good shot, but when you want to go to the cute park down the road and they can't come, it's going to get harder and more disappointing. And, if your significant other is anything like mine, they don't always want to be taking the 30 minutes out of the day to take the photos, especially in the dead of winter. And my suggestion? This off brand remote is better than the Canon remote (I own both because I lost remote then found it, tehe). 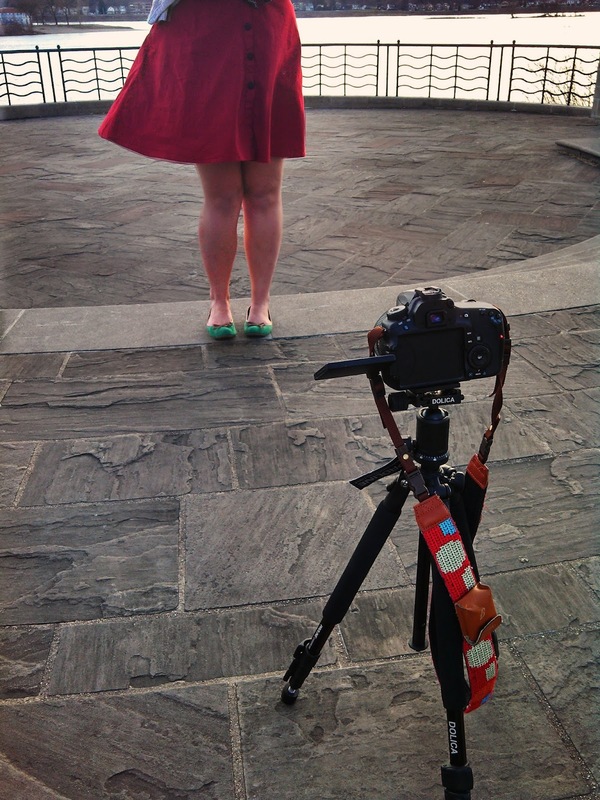 And this tripod is awesomeness. Quick plate release is necessary - trust me! This just means you attach a plate to the bottom of your camera. I leave mine on all the time (see in the photo below weird leg like things sticking out from the bottom) and I can easily attach it! It works for our video camera and point and shoot as well. One of the hard things is figuring out when you are in and out of frame. I suggest using a prime lens (like a 50mm that stays at one distance - Canon user? Try the 50mm f/1.4 Nikon user? Try the 35mm f/1.8 - I use this one at work at love it) or setting your kit lens to around 35mm. This way you can figure out how far away you need to be to be in frame. This is a learning process. When taking photos, walk back and check to see if you are in frame. Mark your spot with a leaf or drawing something in the dirt or noticing a certain crack in the sidewalk you are standing on. If you are in frame, stay there. If not, try, try, try, again. Don't expect to start getting the best photos ever at first. Start by taking photos somewhere you are comfortable with - your porch, a well lit area in your home, or your driveway. As time goes on, try and branch out a bit more - a cute wall down the road, a brick wall nearby, or something else in your neighborhood. Eventually, enough of doing it in a place familiar to you will build your confidence. 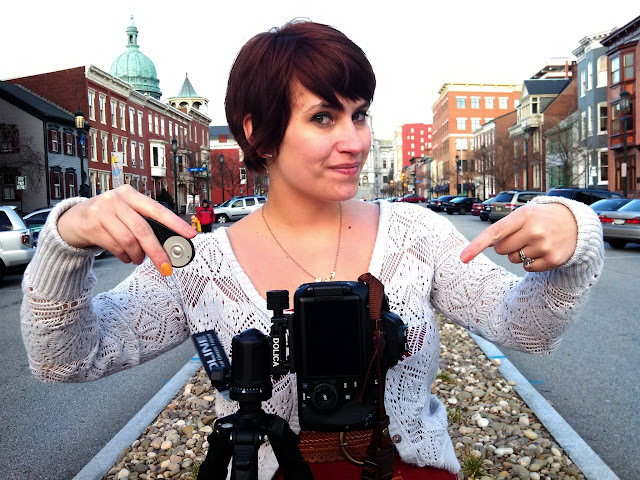 It also helps to make you feel comfortable with the idea of a tripod, camera, and yourself so that when you put yourself out in public with it, it's not like you are doing it for the first time. This photo above was my go to field for awhile - directly to my right is some office building. Ha! 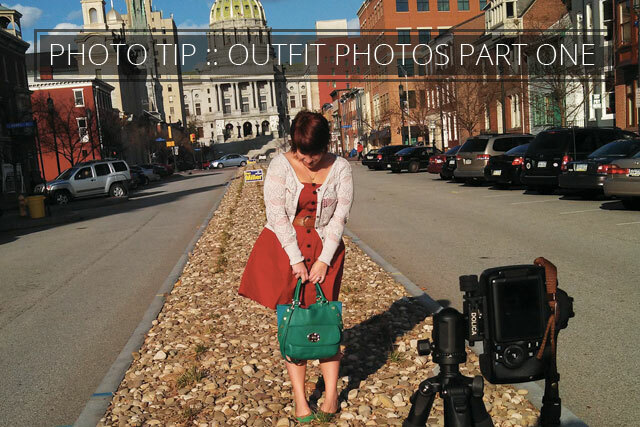 If you know you will be doing an outfit photo shoot, set aside time in the day. Maybe you'll take them right after work or on a weekend? Know what you plan to take and where you plan to take them. Doing them on a whim can make you feel frustrated and rushed, and ultimately, result in less than stellar photos. Also, be sure to bring along any props or other things you may want to photograph! I will say this again and again and again. Breathe and just do it. It's really not that big of a deal in the scheme of things, and you will be so much happier when you get photos you like. Starting slow and in more private areas will get you used to posing for the camera, dealing with your remote when it's being finicky, and figuring out how to take the shots. When you venture out, there might be people. They will not be predictable. Some may want to talk to you - ask you about photography, for money, to take their workout videos, who knows (all of those have happened to me). You can tell them what you are doing, make something up, or do whatever. They probably won't remember. I carry my card with me just in case - it helps make it less awkward. I've only handed it to one guy who literally knocked on my car window. Some will just stare, intently, and not even look away when you stare back. By the way, I often just stare back. Didn't people learn staring is rude? Nope. They didn't. And some will just walk past, politely staying out of your way. In the end, they won't really remember you. You aren't affecting them. Just smile, and be brave. This is the preliminary post. I think this has to be broken down a bit for readability. The next one will go into a bit more detail about taking the photos, figuring out 'your' poses, and more. Hey Katherine! I love these posts so much. Your point about describing what you want to your boyfriend is pretty apt. I was taking photos with my other half at the weekend and I know I was a little bit disappointed because the photos didn't turn out the way I wanted, but I like the thought of sketching some poses out before hand. And even though I have a handy boy I really think next pay day should involve a tripod purchase at last! Seeing as you are so good at these DIYs - how about some blog design DIYs! *being cheeky* I ask because I literally just spent an hour trying to work out how to design unique buttons for pinterest and the like that everyone seems to have. I don't know how people make such nice matching themes and yours always look cool. Yay! So so glad you did this post Katherine! You are the best photography advise giver. You're right--we all start somewhere. And it does get easier to do it yourself after a while. I love this post! I really enjoy these post. Thanks for all the tips. 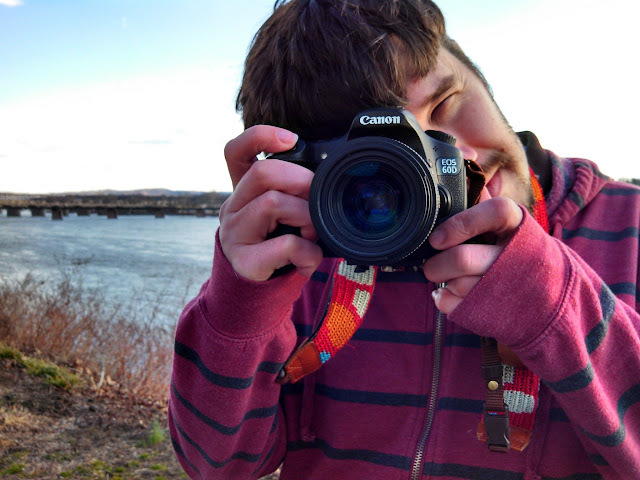 This summer I really want to try taking some photos of myself outside at at a park like you do. your tips always are so helpful! <3 thank you for sharing love! I should mention Jason does take some of my photos - especially when we're in Disney or in public places. Having someone take them is quicker! Now he's taking them more often, but before November, probaly 95% of my posts were taken by me. Now it's maybe 60% Jason 40% me. Thank you thank you THANK YOU for this Katherine! You have some of the best photos of any blog out there so it's great to get your tips and details :) and I especially love that you pointed out how no one starts off perfect! I feel like I've already grown so much in a year and a half of blogging from where I started but I'm definitely not where I want to be, it's a process! Thanks for the reminder :) You're the best! I'll definitely be using these tips! Dudeeee, I'm seriously on the hunt for a private-ish space to take photos at. I'm nowhere near ready for public places, but maybe a little park with minimal traffic would be a good starter. Thanks so much for the tips! Thanks so much for sharing these tips, Katherine! I'm a newbie to outfit photos, and I can use all the help I can get :). This is probably the best post I've ever read! This has been amazing advice that I am going to put to good use :) Thank you!! As a fan from our 365 project days, Its been awesome to watch your photography evolve. You are a very talented fashion blogger and these tips are really handy and I might even try a go at doing one myself! Thank goodness for a long suffering Mr, I have one of those! I love these posts so much, Katherine! I haven't had too much time to really get to know and learn how to use my new camera (which is why the pictures still aren't that great), but I've definitely been reading through your photo tips posts and they're so helpful! I can't wait to read the next one. What great advice, thanks Katherine! I don't do outfit post because I got nothing stylish to post, but this tips are for sure great! I love to take photos and I think a tripod it's essential, even for those who love macro. And the tips to where to start and to plan I think are essential, because sometimes when something it's done quick just because other do creates an ugly result. This is awesome! Thank you so much for posting these tips! Definitely going to look into the majority of these (thankfully I already have both a tripod and remote!). lovely blog! :D These are really great tips for someone starting out. It can be super overwhelming! Ps: I want a "Zinc" cocktail right now! sounds delish! These are great tips and all of which you will experience naturally if you fashion blog. I feel very fortunate that my boyfriend is as into taking photos of me as I am into having them done. It's a huge help. I am lousy with a tripod. Why are those things so confusing? These are really great tips. The last tidbit is my favorite, mainly because it's really something I need to work on. I also think it's hilarious that you've gotten a request to film workout videos--haha, of all the things! But really, your bravery is quite impressive. And having cards with you is a smart thing, especially in a public place. I would love to take more pictures in new locations by myself, especially in ones that are slightly shaded during the day so the pictures don't come out so horribly bright and contrast-y. I need to get a tripod I think that would help a lot! I know exactly what you mean, every time I found nice location for the shoot I couldn't convince my hubby to go there during the weekend, so I got a remote control and now I take photos myself-life is much easier now:)) Great post as always! yes, thank for for this post! ah, tripods and timers and buttons for timers are best friends! i really love the tips you added here, i will keep them in mind for further photos! Thank you so much for the great tips! I'm going to love this little series. That remote seems almost too cheap to be true! I truly thought it would be awful and maybe last a month. I've had it almost a year now and it works 100% of the time where as my Canon remote would just stop working half the time. I've been meaning to get a remote for a while now. I can usually find someone to come with me to take some pictures, but there are occasions when no one is around! I have a tripod, but it's just so cumbersome. I'm wondering if I should just stick with it since I have it already, or if I should look into getting one that's slightly more compact. The thing is pretty darn heavy! I need a tripod and a remote badly. Asking my hubs to take pictures of me is like pulling teeth. I agree - tripods are life safers!!!! A high majority of my self portraits are done with tripod and remote too. . though less likely this year than compared to previous outfit posts I've done in other years. It is fun and easy. I've loved reading your photography tips (seriously they helped SO much) and these are great too! I know buying a tripod is the right move, eventually....I'm just hesitant and haven't yet. So I super appreciated your tips when another person is photographing you. AND including the beginning pictures from awesome blogs. Nice perspective :) thanks Katherine!